Have you seen the movie remake of The Great Gatsby yet? I remember seeing the preview. When I saw the bright colors and all the excess, I thought, Finally! A movie where CGI glitz actually makes sense! I want to see it! Then I looked over at my boyfriend, Johann, expecting to see his face disfigured with a nasty expression. It wasn’t! We even decided we would re-read the book together before going to the movie. 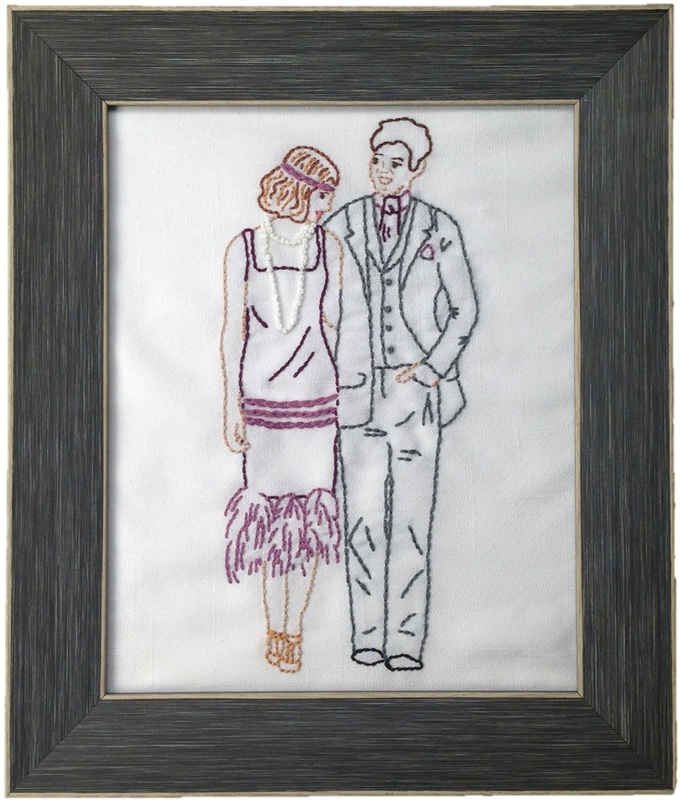 I didn’t decide whether this is supposed to be Daisy and Gatsby, Nick and Jordan, or some other couple at one of Gatsby’s parties. 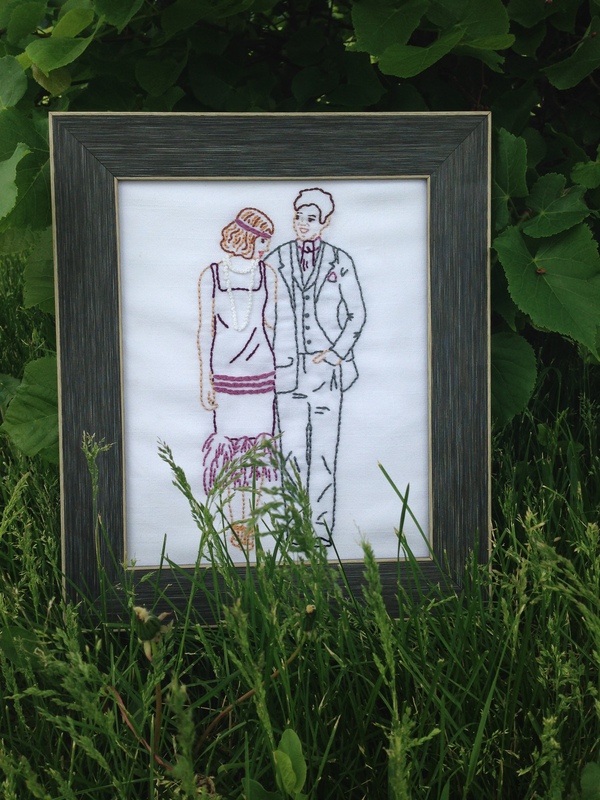 I’ve never been a great drawer, so I used some engagement photos to see what it looks like for couples to walk side-by-side, a Robert Redford movie shot to determine I should have his hand in his pocket, and countless other photos of clothes from the Roaring Twenties to help with the beads, feathers, and dropped waistline. I always thought original drawings needed to come straight out of someone’s head. I found my method is actually more like making a collage — and it worked! 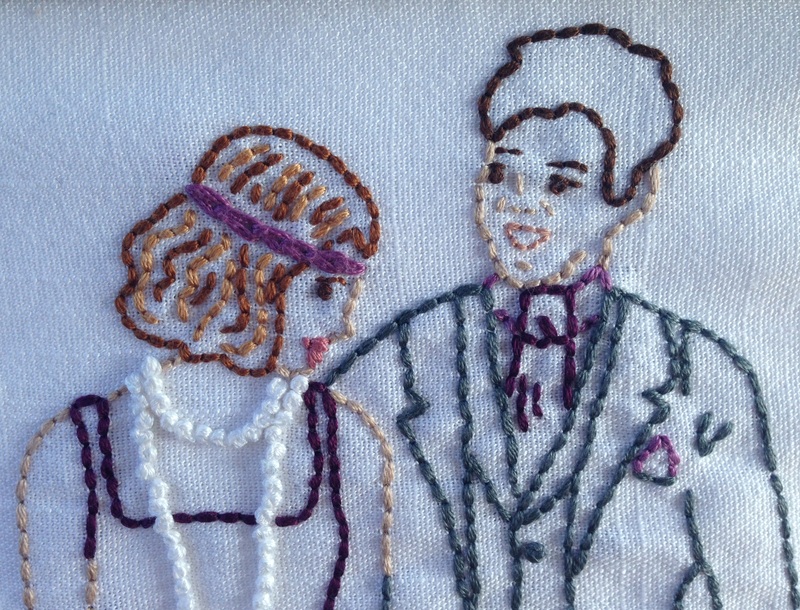 I typically use three strands of floss for embroidery, but since this is 8″ x 10″, I used all six to make the lines thicker and to fill the space. I used fewer strands for the facial features to keep them from getting bulky. 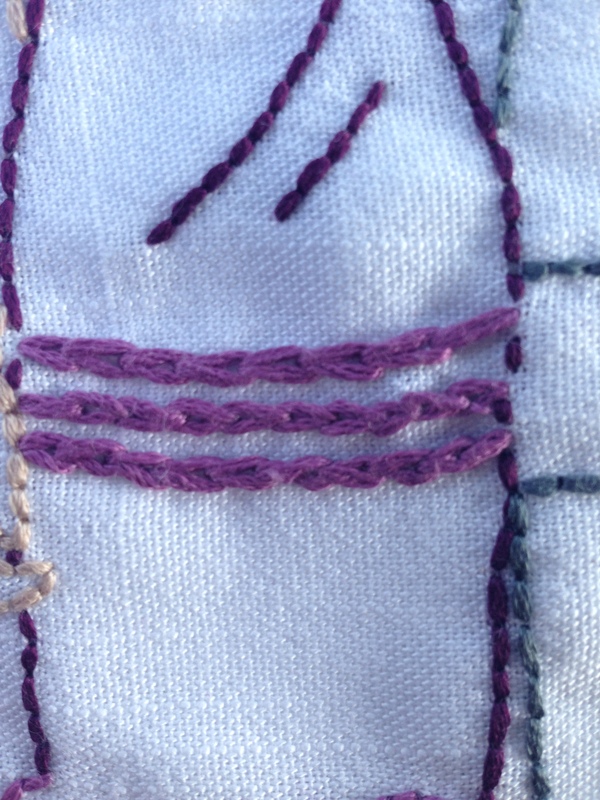 …the skirt trim and headband (made with chain stitch). The outline is nice, but I think it still looks a little blank. What do you think? Should I try using crayon to fill in the image? 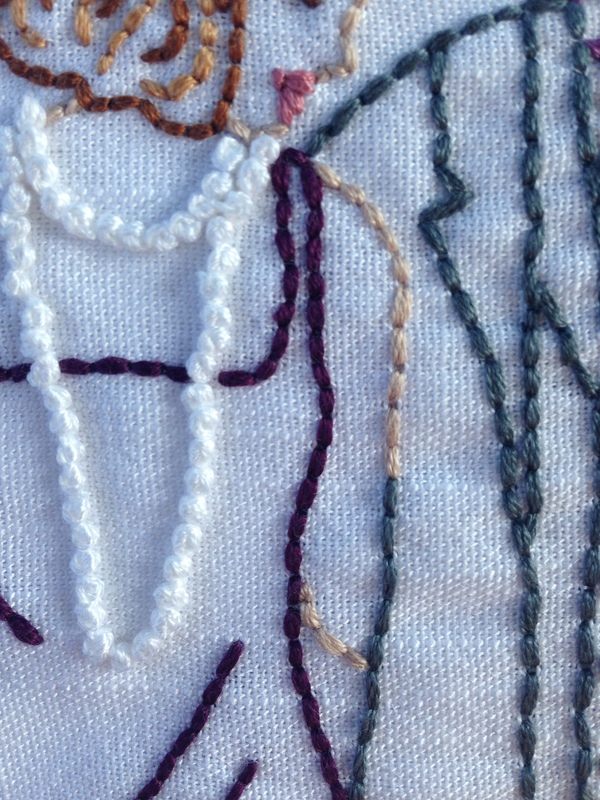 (I’ve had success with this before, even after the stitching was finished.) I am especially concerned about his hair. 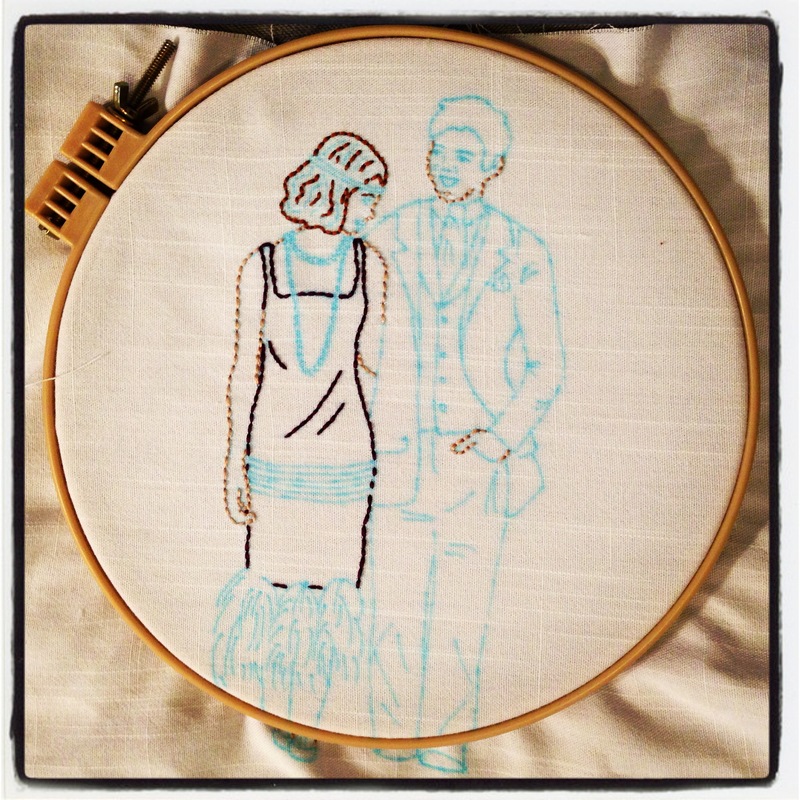 Categories: Embroidery | Tags: back stitch, backstitch, chain stitch, collage, colonial knot, colonial knots, craft, daisy buchanan, design, draw, drawing, drop waist, dropped waist, embroider, embroidery, feathers, gatsby, gatsby embroidery, giveaway, inspiration, jay and daisy, jay gatsby, jordan baker, movie, necklace, nick and jordan, nick carraway, process, project, roaring twenties | Permalink.